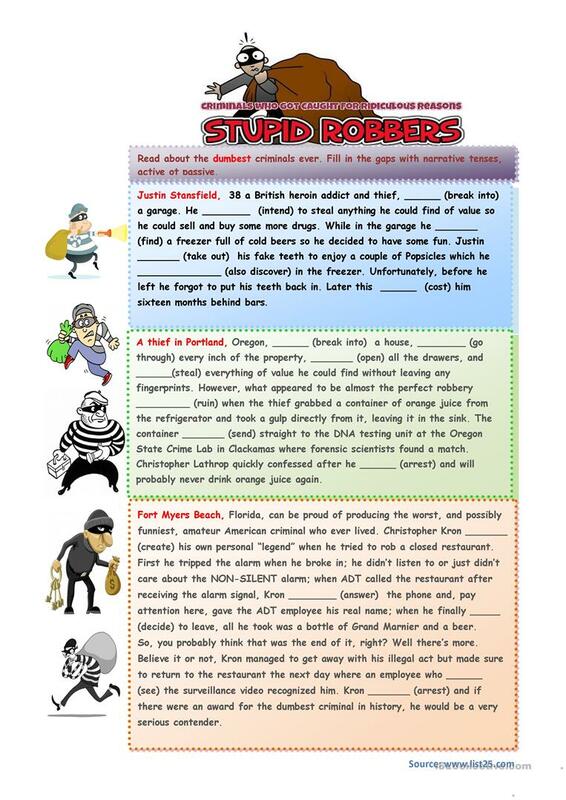 This worksheet consists of three very funny stories about world´s dumbest criminals. SS read and fill in the gaps with correct tense forms - narrative tenses, both active and passive. The above downloadable teaching material is meant for high school students, elementary school students and adults at Pre-intermediate (A2), Intermediate (B1) and Upper-intermediate (B2) level. It is a useful material for revising Passive voice or active voice, Past perfect simple tense, Past simple tense and Past simple & continuous tense in English, and can be used for improving your learners' Reading skills. It is focused on the vocabulary topic of Crime, law and punishment.